At the Powell Dental Group, we strive to provide a better kind of dental care than your average dental office, and in order to do that, we know we need to have the best equipment available. 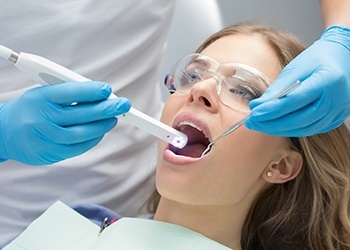 That’s why we’ve invested in some of the most advanced dental technology, including digital X-rays, intraoral cameras, and a putty-free impression system. These tools will help speed up your appointments while also improving your quality of care, giving you the best of both worlds. It can be hard to understand what your dentist is talking about sometimes! You know what all the words mean, but you literally can’t see what they’re referring to when it comes to your smile. Our intraoral camera closes this longstanding gap. Now, we can capture and show you high-definition images of your teeth and gums right in the treatment room. We can use them to show you trouble spots and discuss the benefits of potential treatments so you’re always fully informed about your dental health. There is so much going on with your smile that is hidden from the naked eye, and to make sure we don’t miss the earliest signs of a potential problem, our team uses X-rays every single day in our practice. Digital X-rays have several advantages compared to traditional film radiography, including faster development times, higher-quality images, and less emitted radiation (about 90% less on average!). 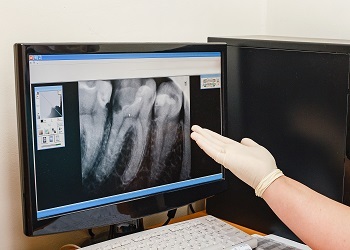 Plus, because they are digital, the X-rays can be easily and infinitely stored, sent, and copied as needed. Creating a working model of a patient’s teeth used to mean that they had to bite down onto cold dental putty for minutes at a time, but thankfully, that’s no longer the case at Powell Dental Group! 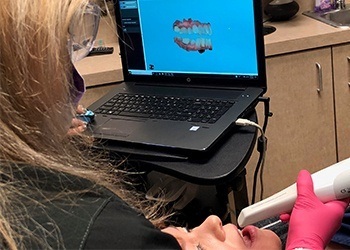 Now, using a CareStream digital scanner, we can create an exhaustively detailed 3D image of the teeth and bite without even touching a patient. This process is not only faster but more accurate as well, saving patients from having to get time-consuming retakes. At Powell Dental Group, we make it as easy as possible for patients to find out if they have sleep apnea. If you're hesitant to spend the night in a sleep lab and desire a first step screening solution, we can send you home with the disposable screening ApneaStrip™. 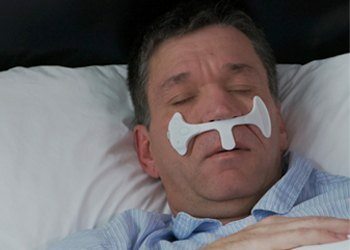 This is a small, easy to use, 100% disposable device that fits over either the nose or mouth, and it monitors the flow of air while a person sleeps. Once in place, you only need to sleep for about four hours to give it all the data it needs. In the morning, you just have to click a button to see the results. A green light means there is a low risk of sleep apnea, while a red one means there is a higher risk. Based on its findings, Dr. Shults can refer you to a local physician to confirm the results and recommend treatment if needed. Early detection and treatment are absolutely essential for surviving oral cancer, which is why we give our patients an oral cancer screening every time they come to see us. To help us find cancerous and precancerous cells as soon as possible, we use an instrument called OralID. It’s a special light that actually causes any abnormalities in the mouth to illuminate, making them easy to spot. This helps us detect problem areas that would normally be hidden from the naked eye, meaning we can guide a patient to get the follow-up treatment they need without delay.